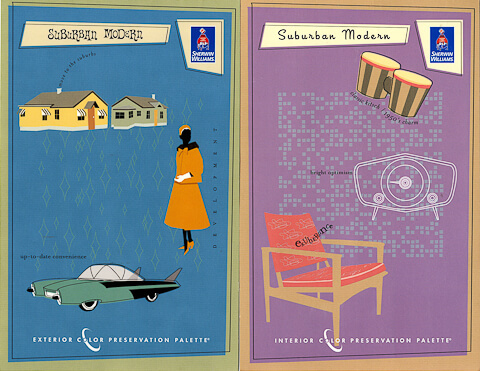 Several readers have written to alert me that Sherwin-Williams no longer has brochures for our beloved Suburban Modern paint palettes in their stores. These have been tried, true, authentic paint colors for our 1950s, 1960s and 1970s colors for years. BUT: You can still get the brochures — with the paint codes — two ways. So far, both the interior and exterior paint collection brochures still are available on Sherwin-Williams’ website. And, just in case they are completely discontinued at some point, I scanned both brochures — interior and exterior — and put them into a downloadable PDF. If you want to try these colors — you need to print out the brochures from online, take them into to the store, match them to sample chips, and then decide whether you want to go to the next step of getting samples. Going through this step-by-step process is really important, because what you see on the computer is likely NOT what you will see on the chip… and then, you always want to test any color on the wall. I was recently in our local (Sonoma County in California) Sherwin Williams paint store and I have found that there is now a group color card called “Historical Colors: Interior Colors” available; it’s a large, 8 1/2 by 11 or so, four-leaf brochure, with color photos on the outside panels and the inner folded leaves, and color paint chips on the inner four panels. As near as I can tell, all the colors from the older, individual era color cards are there, with the same names as before. Each has a small symbol (a square, a star, etc) beside its name which is matched to a timeline at the foot of the panels. Star = “colonial” or whatever. The color chips themselves are arranged on the panels by color families rather than time period. Not as handy, but still worth perusing. As to Sherwin Williams’ grasp of history? not good, at least prior to 1900. The designate “Colonial” as “1800s”: huh? “real” historians think of colonial as from about 1620 to the Revolutionary War, pop ideas of “colonia” pretty much think of the time of the Revolutionary War. The mid 1800s, which is Sherwin Williams’ designation, is the Civil War here in the States, ie, the height of the American “Victorian” period. So “Victorian”, which SW puts at 1900, is really from about 1840 through the end of the 1800s, or just before SW’s designation. I suspect their confusion comes from thinking in terms of the architectual revivals of those styles, especially the Colonial Revival, which was big from about 1880 through the Second World War (and is still pretty strong today!). But enough history lesson. I just wanted to alert folks to the fact that those colors are still available, still with the same names, and easily found now with this new, big, all in one color card (it has a copyright date of 2011). Thanks, David. Your comment is a timely one, as I am just about to head out to run Saturday errands, including stopping at SW to get some paint for my office. I’ll look for this! Oops! I misnamed the paint chip card: it’s called “Historical Collection: Interior Colors.” And my typos in this post were a bit embarrassing (can I plead it was early in the morning here in California and I had just gotten out of bed?) But the paint chip card is as described. hi pam i am on here reading and asking love your blog!! we are renovating this house in a historic neighborhood that is very particular, and we are opening our vintage clothing store in it. we are having the worst time picking out paint colors! we can’t be too funky, the neighborhood won’t like it, and we don’t want to be beige or southwestern either. we are in the southwest. someone from the neighborhood mentioned a miami deco look but i can’t pin anything down. i am using the sherman williams generator but want it to have more than just a solid color. any suggestions? everyone on here is so helpful. we have a huge job ahead of us with landscaping etc. (we lost our store space long story) and are doing it on our own! i tried to figure how to get photos on here but couldn’t figure that out? here’s the flicker set link named 205 carlisle if anyone could help i’d appreciate it!! okay so i picked out burma jade, but since we are on a budget,,, i need to match it to a cheaper paint! sorry sherman wiliams! but 80 a can to 80 for 5 cans is a big difference! does anyone know a good way to match the paint colors? help! i’m at home depot! From what I’ve observed and remember, the most-popular interior colors in the ’50s were turquoise, aqua, and pink, with yellow (either canary yellow or buttercup), red and coral as accent/trim colors. Any color can be matched with today’s computers, so long as you have a piece or a chip about the size of a quarter and it doesn’t have a reflective finish. As of today the brochures are back up. It looks like the new versions have fewer swatches than the old ones, and I’m disappointed because the old Victorian brochure had a lot of compatible shades that I thought I could use together – I played with their color visualizer a bit and now really can’t wait to get some color on the front of my house, hopefully next year.